I’ve been a bit off kilter of late, but slowly catching up with things. Here are some links to places I have been flogging my latest book with all my puny might (have to work on that upper body strength). I’m over at Richard Godwin’s for a Quick Fire at the Slaugherhouse where I talk about the genesis of White Rabbit, a bit about Extricate/Throw the Bones and the forthcoming Drag Noir collection that features Richard and a host of fine writers. Richard’s also got a really lovely remembrance of AJ Hayes over at All Due Respect. I talked about the history of Spiritualism, Fakes and Table Rapping — topics that figure in the novel — over at Charlene Raddon’s blog. I was also in the spotlight over at Annie’s Book Stop in Worcester, where I talked about all kinds of things. Drop by and see for yourself. White Rabbit is a marvelous and potent cocktail of crime fiction, screwball comedy and the supernatural. A cracking yarn choc full of brilliant lines that reminds you of Wodehouse, Preston Sturges and the Coen Brothers and yet is like nothing you’ve ever read before. Fantastic stuff. More please! Mr B is aces. And a fine one also from the QoE: “White Rabbit” is a fun, intriguing story that sucked me in, took me on a corkscrew ride and never let go until the end. A wonderful blend of magical, gritty noir fresh from K.A. Laity’s literary cauldron. I love this cover. It screams Art Deco like a bakelite phone (there is one mentioned in this book). Did I mention how much I love this cover? This needs to be a poster, with shell shaped up-lighters. He also goes on to say a lot of nice things about the insides of the book, too 🙂 I’m pleased to see interest slowly building. Small publishing lives in the long tail. 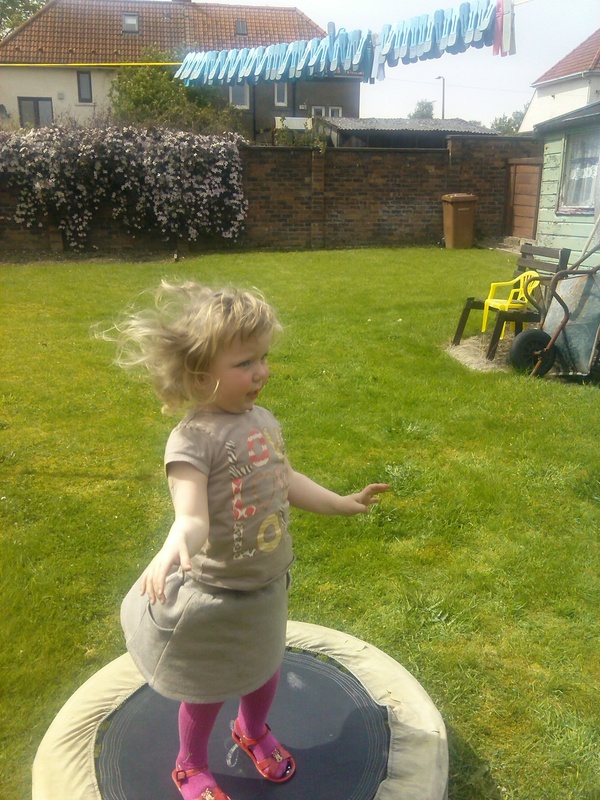 Just so this isn’t all about me, here’s a picture of Charlotte bouncing on a trampoline: cute as a button, isn’t she?